The series gets a serious makeover. The litmus test for any game that is part of a long running sports series is to measure how it stands up against previous efforts. 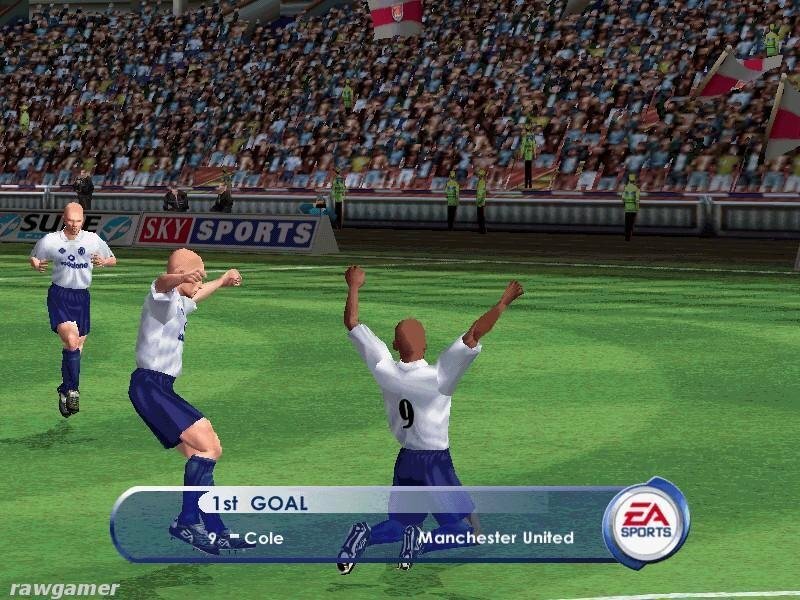 When you compare EA Sports’ FIFA 2000 to FIFA 2001, what you have are two wildly different games that are similar only in that they deal with the same subject matter. Simply put, this is a whole new ballgame. The difference rests in the how the game plays on the pitch. The pace is more realistic, thanks in part to the fact that you can finally choose to slow things down. The series has needed a “slow” game speed setting for years, and its effect is immediately noticeable. The pitch itself is much larger, too,giving you more space to set up plays and to survey the landscape before committing to a maneuver. The pinball-like gameplay of years past is replaced with a much better brand of football. It’s not going to pass as an exact replica for what you see on ESPN, but it’s the best portrayal of the series in years. The defensive AI is very tight. 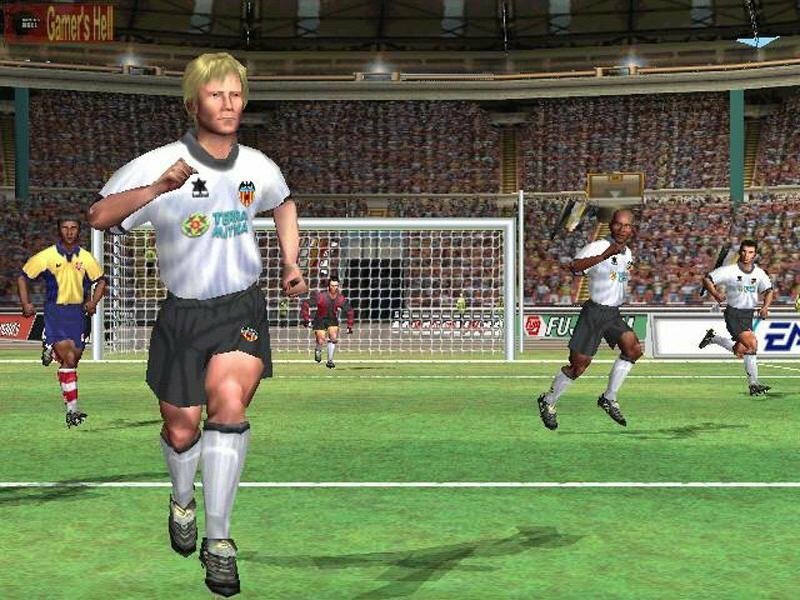 In FIFA 2000, it was fairly easy to weave through the computer defenders. Here, marking is much improved, and on the highest level of difficulty you are forced to work for each and every quality shot you take. The computer is also much better at tackling and stealing the ball from attackers. It takes a highly skilled striker or forward (such as Owen or Bergkamp) to take on more than one defender and come out unscathed, and even the best players rarely accomplish such a feat. 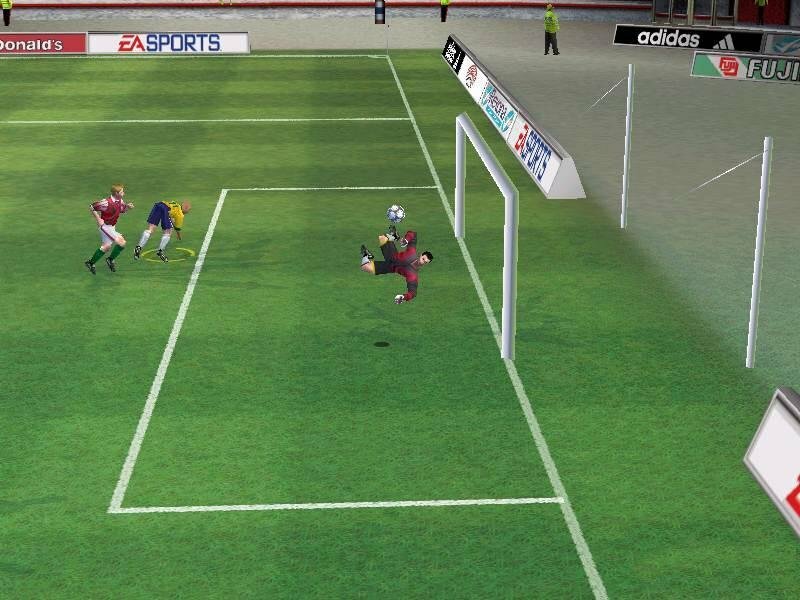 It’s simply one of the tougher FIFA games you’ll play, and amateurs will need some time to get adjusted. 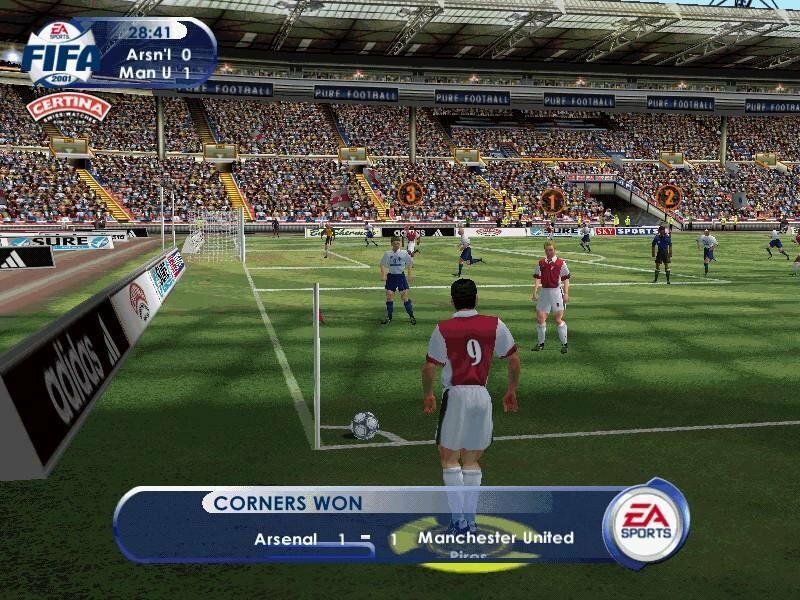 EA Sports continues to improve the visual quality of its games and FIFA 2001 is no exception to that rule. 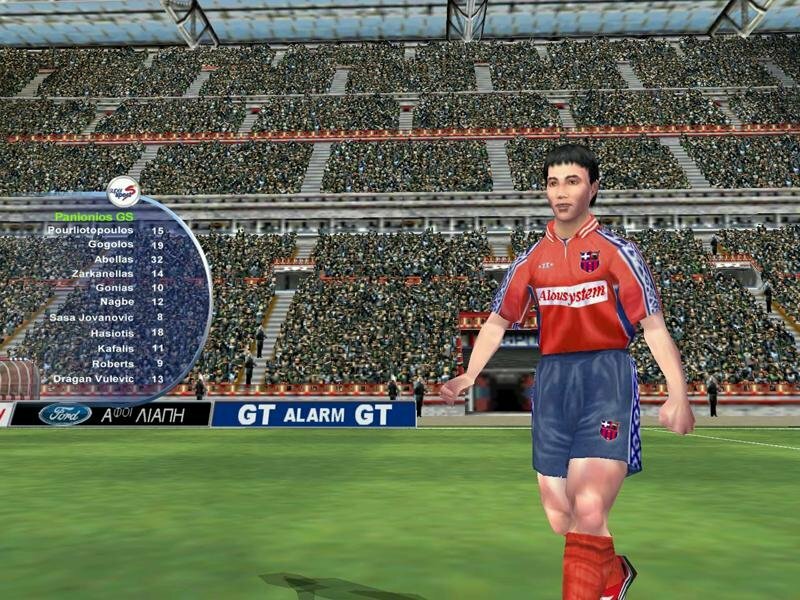 It’s easy to forget that FIFA 2000 limited the resolution that you could play at, but this version allows resolutions over 1024×768, and it certainly shows. The animation is more realistic, and the pitch itself looks extremely crisp. The shadows are truly amazing—when you play a day game, the shadows from the towers overhead loom over the field. This sets the atmosphere to a level never before achieved in a soccer game. There are a few issues, however. It’s impossible to custom configure your gamepad—you are stuck with the default control settings. Another pre-game oddity is that you cannot play a 12 or 14 minute half. You can set the clock to four, six, eight, ten, 20, or 45 minutes. A 12-minute half would be ideal as ten isn’t quite long enough and 20 or 45 are marathon games. The computer coaches never, ever use substitutions unless a player gets injured; fatigue isn’t reason enough for the computer to make use of its bench. There is still no trade AI in the game. If your squad has the cash, it can buy any player in any league. Need a great offensive player? Does your team have money burning a hole in its pocket? Give Arsenal a call and buy Dennis Bergkamp. It’s just that easy. It would also be nice if the game provided more post game stats other than goals scored and bookings. Who racked up the most tackles? Who won the most key headers? Which player passed the ball most effectively? The offensive AI could use a bit of work. 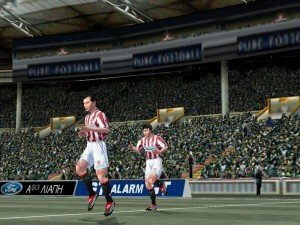 Most goals scored by the computer are due to great individual efforts rather than beautiful passing and playmaking. Finally, the speed burst effect lasts way too long (it would be nice if you could fine-tune this as you could in NHL 2001). Good players have the ability to run at full speed up and down the pitch without breathing heavy. 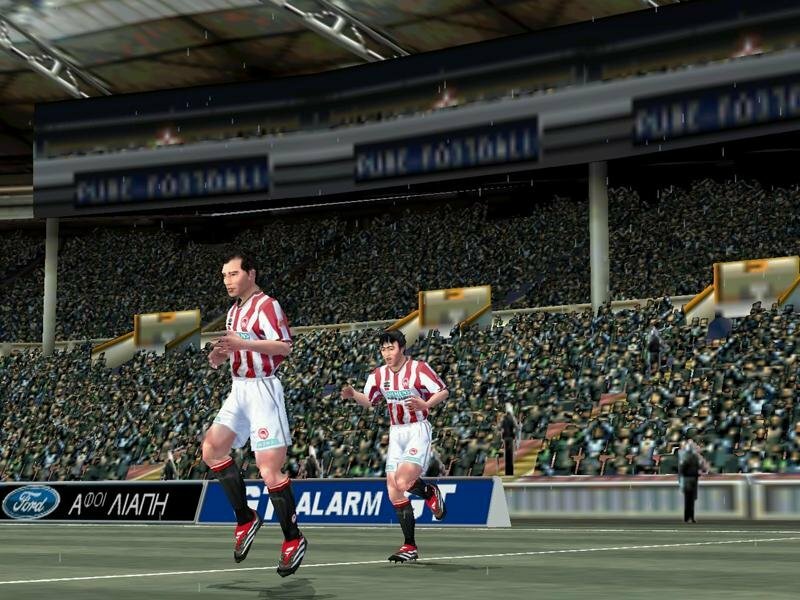 The audio, a feature that North American gamers complained about extensively last year, is back on par with the return of British commentator John Motson. The failed experiment of having American MLS announcers provide the play-by-play last year is hopefully one that will never again be repeated, and it shows that the developers at EA Sports listened to feedback. Motson’s commentary is not the only good aspect of the game’s audio. The players themselves are vocal this year; they yell, grunt when tackled, and generally make quite a racket. This can really be heard if you (shudder the thought) disable Motson’s commentary. The fans also get into the flow of the game, and cheer and boo at the right time and really let out a moan when a hard sliding tackle isn’t whistled as a free kick. Quibbles aside, this is a solid title. Little things about the game’s overall presentation help add to the experience. You can finally enable player names to appear below each player on the pitch, and this makes is so much easier to tell who is who. The game is loaded with modest and subtle changes like this that end up adding a lot to the game. 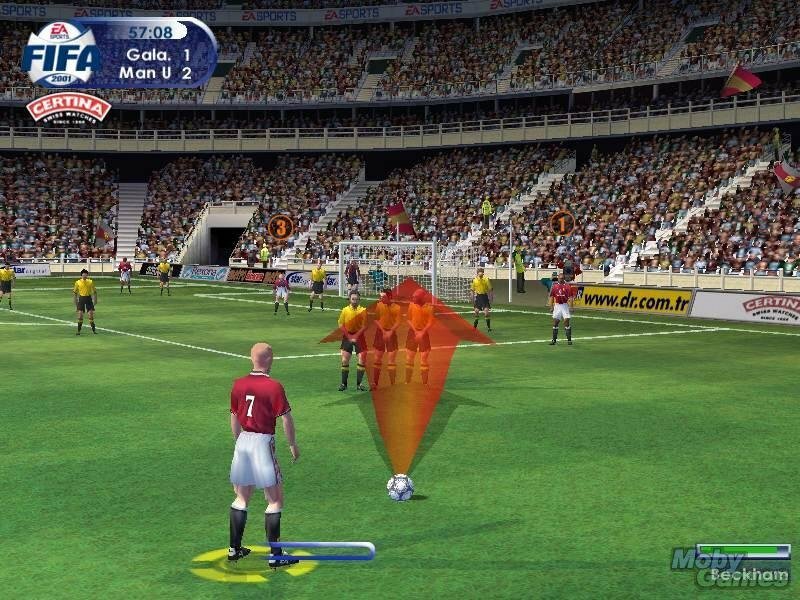 If arcade soccer is your forte, then FIFA 2001 is a must try. 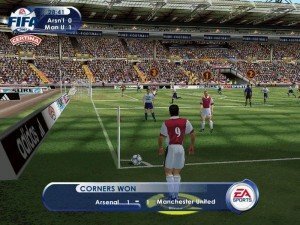 It’s competitive, pretty, is loaded with teams and leagues, and is arguably one of best FIFA games ever made. ey there mate, downloaded the file but there was no way to install the game, the Read Me file said something about an Autorun app but there was none there, can you please help? Read the NFO file with NotePad. You have to run the registry program and 3D Setup. I managed to get this running in Win95 compatibility mode in XP. I searched and I didn’t find the registry program,how is named? Game does not work. Setup is corrupt.